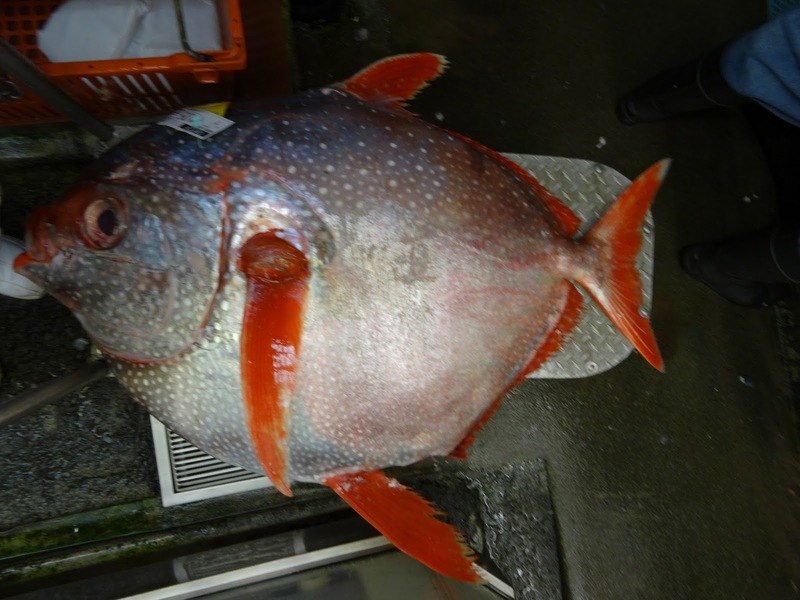 Locally-caught monchong, a deep-sea Pomfret, has been appearing lately at Costco. It’s affordable, and has a delicious flavor. Brett and I have decided that no matter what, we need to defrost the freezer next weekend. We will be finishing up the last of our food shopping for the month the week after, and need to have the freezer cleaned out and ready to go for that haul. 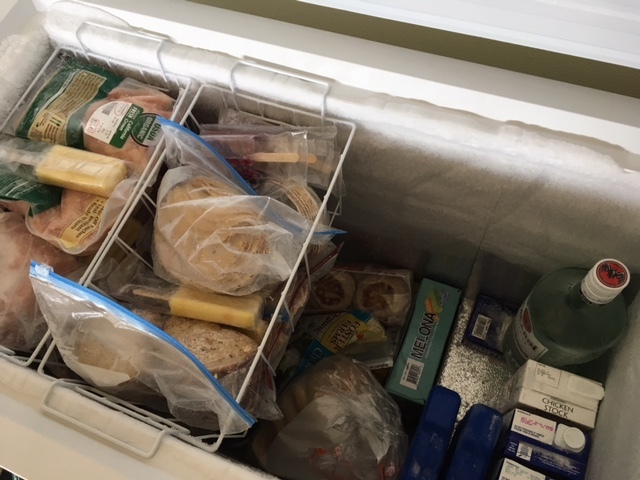 I think by the end of this week we’ll have everything down to where what’s leftover can fit into the inside freezer or the cooler while the defrost takes place. A big goal this coming month is to increase the amount of fruits and vegetables in our diet. I think we do a pretty good job already, but know we can kick it up a bit. YaYu consumes most of the fruit we buy, and eats a lot of vegetables, but we’ve stocked up on vegetables for snacking, and I am going to work at having at least two servings of fruit each day. Citrus season is starting here, and I’m looking forward to enjoying local mandarin oranges and tangelos, as well as making fresh orange juice. Although this month I’m going to start eating meat again in small amounts, if desired, this week I’m still pretty much sticking to a vegetarian/vegan diet. We won’t need a whole lot from the farmers’ market this week as we’re going to be using up what we have on hand as well as the last of some frozen vegetables. We will need to get some tomatoes and cucumbers though for the panzanella salad, as well as some citrus fruits and bananas. I’m posting a day early this week because we’ll be out most of the day tomorrow with my friend and former high school classmate, Becky, and her traveling companion. Becky’s husband, Richard, passed away at the end of August, but as Hawai’i was one of her husband’s favorite destinations, she decided to go ahead and take the all-island cruise they had booked earlier in the year. We have a full day planned tomorrow with shopping, lunch, a rum tasting and lots of visiting. We met with Becky and Richard last March in Arizona, on our way to the Grand Canyon, and I’m happy to have the chance to see her again. My new exercise bike arrived on schedule last Monday, Brett got it assembled, and then I promptly pulled a muscle in my left leg by overextending it while I rode for the first time. That has almost healed though, and I’ll be back on the bike on Monday (at a different setting!). But, if it’s not one thing it’s another, and I also seem to have somehow developed a case of swimmer’s ear, so will be up to see the doctor this week to get that taken care of. On the other hand, my back is doing great! I rarely experience any pain now, and am pretty much back to doing everything again. Brett is helping more though – there are some activities that we think it’s best that I not do any more, like bending over to do the laundry, and such. The location for this scene from The Descendants is just 3 minutes from our house! 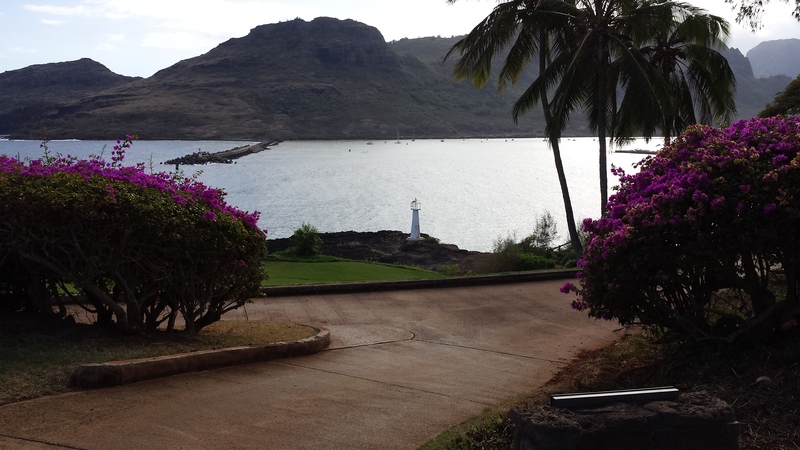 We had a lovely Thanksgiving Day and dinner out at the Hukilau. 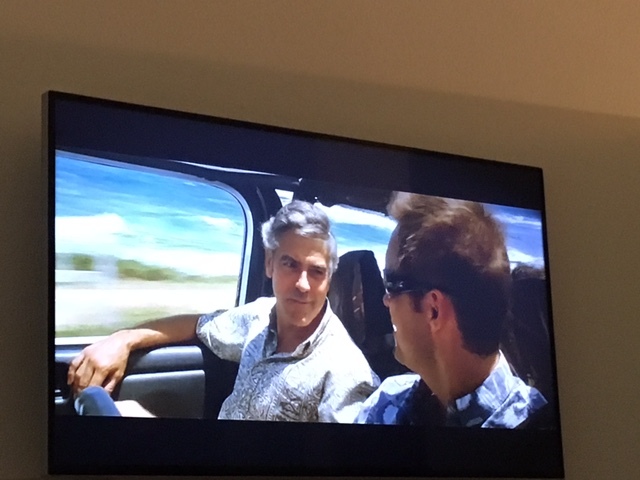 We had our traditional viewing of The Descendants before we left for dinner and discovered even more geographical weirdness/impossibilities – I guess the filmmakers figured that not enough people from Kaua’i would ever watch the movie that they had to strive for accuracy. 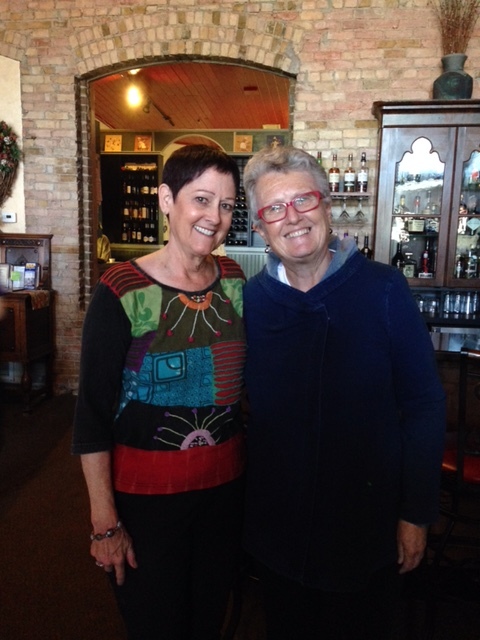 Our Thanksgiving meals were amazing – YaYu is still talking about hers! The Hukilau gives you a LOT of food for your money, and we all brought home leftovers. Reading: I’m still reading It Can’t Happen Here. I can only read a small amount at a time though because it’s too depressing otherwise. Another library book became available, The Wangs vs.the World, by Jade Chang, so I’m reading that as well. Listening to: Another cool, overcast breezy day here today. It’s quiet outside, just the birds singing, but the washing machine is doing its thing inside so not all that quiet inside. Watching: Brett and I are still watching The Americans; we’re into Season Three now. Such an intense show! We all watched The Descendents, with George Clooney, before heading out to our Thanksgiving dinner. Love that movie, but boy do they screw up some of the locations on Kaua’i. Cooking/baking: Tonight leftovers are on the menu, so no cooking today. We brought home food from the Hukilau on Thursday, and also have plenty of King Ranch casserole left over. 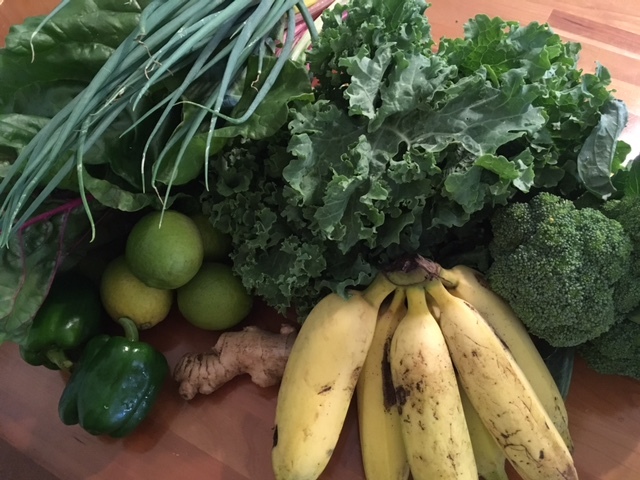 Our farmers’ market haul: green peppers, limes, ginger, bananas, Swiss chard, kale, green onions and broccoli. all for just $14! Happy I accomplished this past week: I was able to return to the farmers’ market for the first time in weeks this past Wednesday, and enjoyed that again immensely. There wasn’t much on our agenda otherwise, but I got everything done around the house that I had planned, so feel good about that. 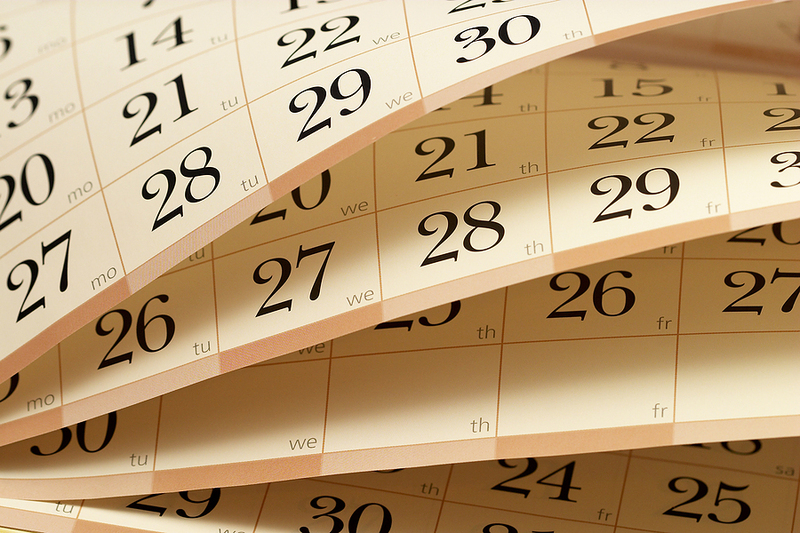 Looking forward to next week: Besides our day with Becky tomorrow, there’s nothing on the calendar this week. We have to get one more thing for Meiling, and will take care of that this week, but when it’s done we are finished with our Christmas shopping! Thinking of good things that happened: We had a very nice week overall even though it’s been rainy and overcast most of the time. I got my hair cut, and Thanksgiving dinner was lovely. We had no food waste, and put $8.28 into the change/$1 bill jar. Grateful for: Even though Brett and I are very different people with divergent interests and tastes, I’m grateful that we still enjoy each other’s company so much, and agree on the “important things.” After nearly 40 years together, I’m still his best friend, and he’s mine. I love too that he can still surprise me after all this time, always when I think I finally have him completely figured out. Bonus question: Did you buy anything on Black Friday? I have never bought anything on Black Friday! There is nothing out there at any price that could entice me to get up early, or deal with the crowds. I try to have all my Christmas shopping done (mostly online) by the time Black Friday rolls around. Brett and I are picking up one more thing for the girls when we’re out on Sunday, and then other than picking up one gift card at Safeway, and finishing up our holiday food shopping, we are done and ready for Christmas! I am by nature an optimist. I always look for the good, for the silver lining, and remind myself that nothing lasts forever, both good and bad. The world is always changing because that is the way of the world. 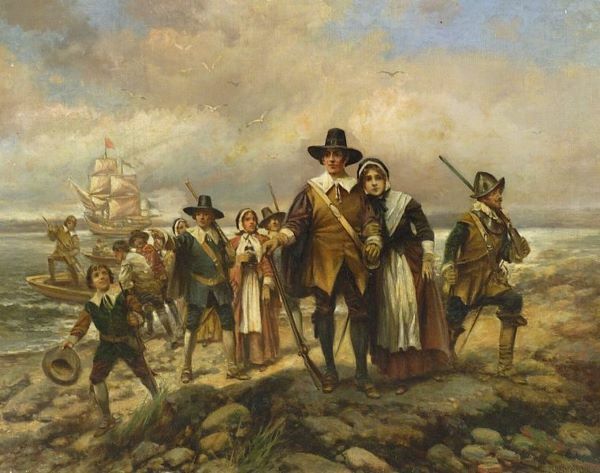 This Thanksgiving, the mood here at Casa Aloha is one of great uncertainty, like that of standing in a marsh and unsure of whether the next step will be solid ground or quicksand. Changes are coming, but how they will affect our family and friends, our nation, and our futures are unknown. 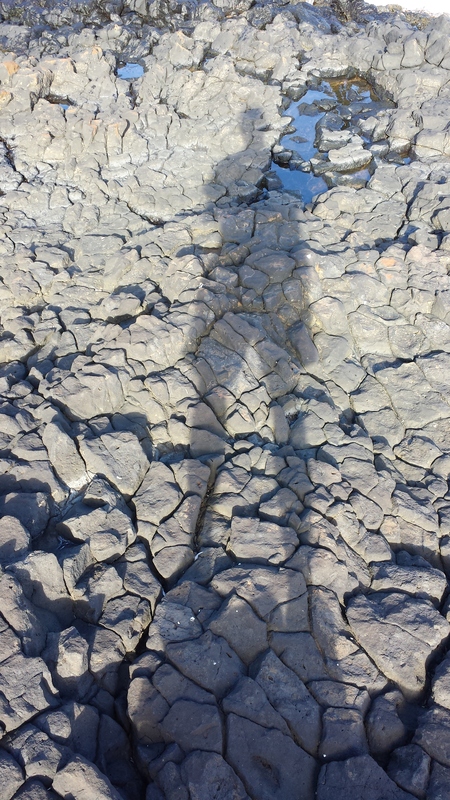 None of the foundations Brett and I put in place seem as strong as they once did; there are no longer guarantees they will remain as they are, or if they do remain, in what condition. Brett and I are in good health. Our children are healthy and thriving. We have two beautiful, healthy grandchildren. My mother is still with us. After 40 years together Brett and my partnership is as strong as ever. We’re still in love, and enjoy each other’s company every day. We live in one of the most beautiful places on the planet. We have enough to eat, more than enough actually. We have a lovely home. We can pay our bills, save a little, and have enough money left over to travel once in a while. We know how to live frugally. Sending all of my American readers warm wishes for a blessed Thanksgiving Day! In years past this week’s menu would have been crowded with dishes celebrating all things turkey: roast turkey with all the sides, turkey divan casserole, turkey pot pie, hot turkey sandwiches, turkey soup and so forth. 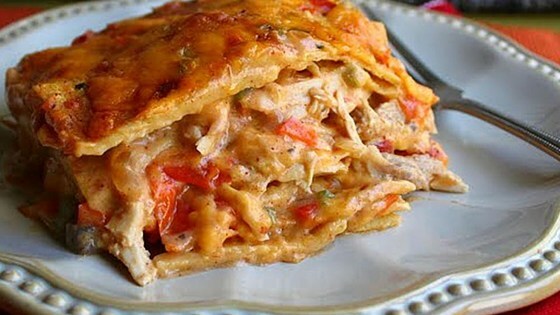 Just the thought of many of them makes my mouth water – I love turkey, and doubt I would have passed it up on Thursday. But turkey on the menu will have to wait. There’ll be none of it for us this week other than Brett’s turkey dinner at the Hukilau Lanai. It will appear though when all the girls are here next month; in fact, I’m planning to make a full turkey dinner the day our last little bird, WenYu, arrives home. Meiling has been calling every week to ask what I’m going to fix when she’s home, and she has asked specifically for turkey and all the traditional leftover meals. 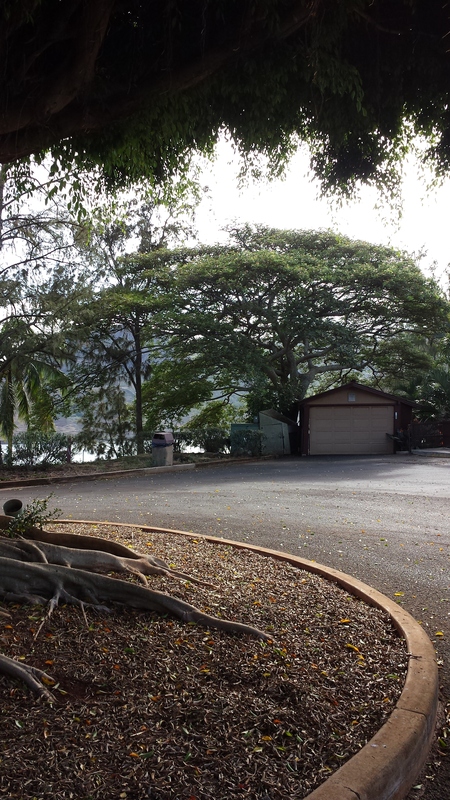 By the way, I haven’t roasted a turkey since we’ve been here on Kaua’i. It’s been too warm/hot, and the oven has to stay on for too long. These days I cheat by buying a roasted turkey breast from Costco. They’re delicious, and one provides us with at least five meals. Turkey or not, once again we’ll be continuing to work on getting the freezer emptied, and using up what we have. Friday: King Ranch casserole; salad (There are a zillion variations of the King Ranch casserole, but this one is pretty close to how I make it). I’m not sure yet what I’ll be having. Sunday: Tofu & broccoli in spicy peanut sauce; steamed rice. I use brown sugar or molasses instead of honey in the sauce, and don’t freeze my tofu – I boil the cubes for about 6-7 minutes, which helps them keep their shape. I think I am finally ready to head back to the farmer’s market. We need carrots, peppers, limes, greens (kale & Swiss chard), cucumbers and bananas, and will pick up anything else that looks interesting and affordable. I studied Japanese for over seven years. Some I picked up when I lived in Japan, but most of the little I know came from classes I took in college. Japanese is one of the four most difficult languages for English speakers to learn (the other three are Mandarin, Korean, and Arabic), and fluency requires a deep commitment to sticking with it no matter how frustrating it can become. The difficulty in learning Japanese comes not just from the different writing system, but because of the social systems that are embedded in the language. A speaker always has to know their social relationship with the person they are interacting with and choose their vocabulary or form accordingly. After all that study though, I know less than a Japanese two year-old. I can read hiragana and katakana though, the two phonetic writing systems, as well as a few kanji, so I can get around OK when I’m in Japan. I can understand when people tell me how much something costs, or give me basic directions. But, as I found out when I went to Japan for two weeks in 2014, that still didn’t get me very far at all. The command center for the toilet in my son’s condo. 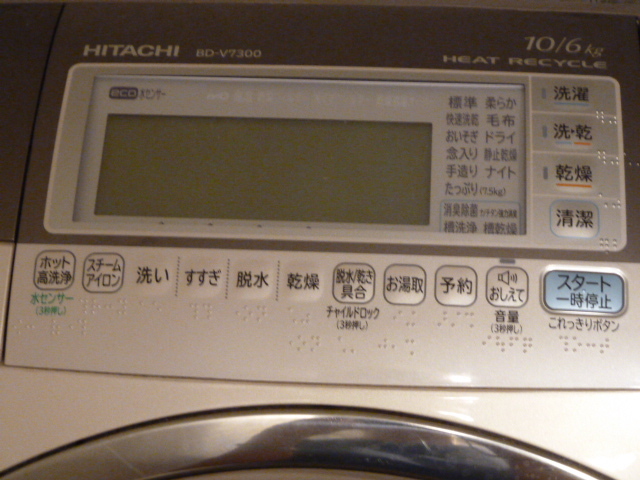 The control panel on their washing machine. I wanted to cry every time I looked at it. 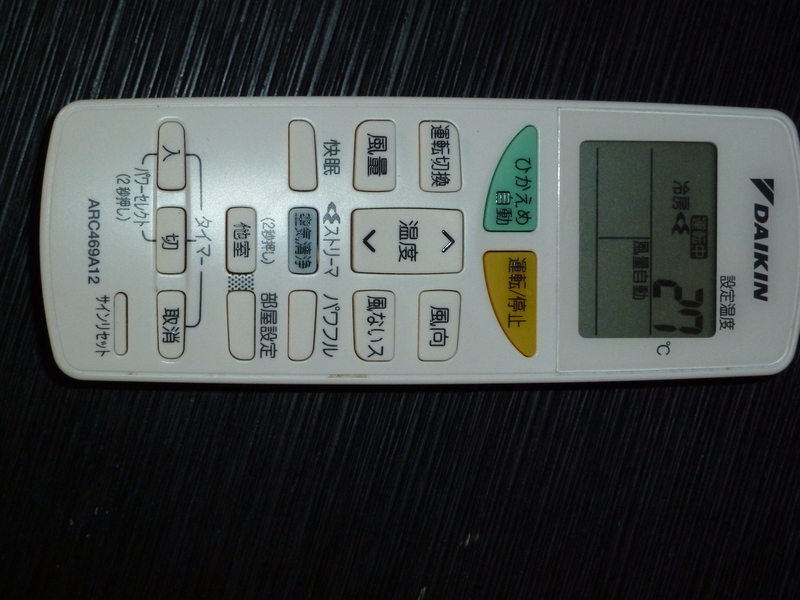 The remote for heating/cooling in the condo. GPS in Japan could literally take me anywhere and I wouldn’t know the difference. It’s not just Japanese though. 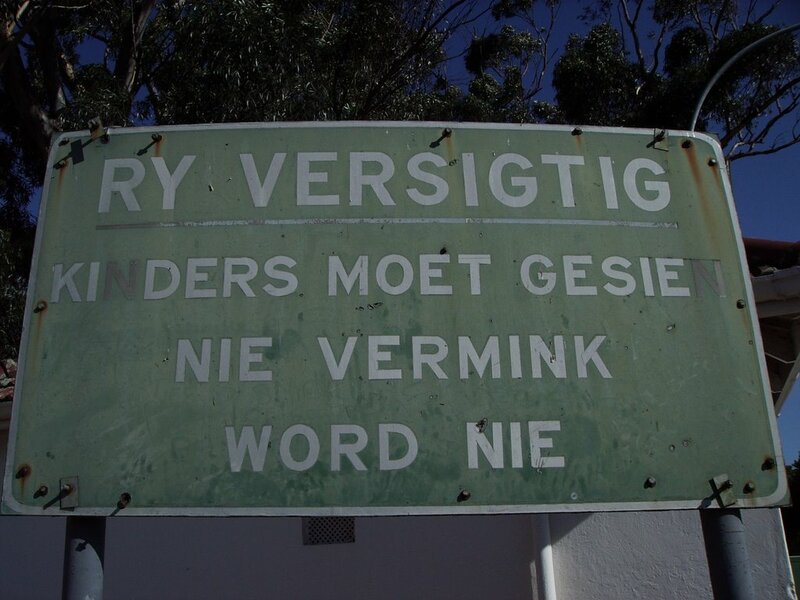 The signs below, one in Norwegian and the other in Afrikaans (South Africa) are just as confusing for me. Get a phrase book and practice before traveling. There are YouTube videos and other sources that can help with pronunciation so that a native speaker can understand you. A little of your host country’s language can go a long way. 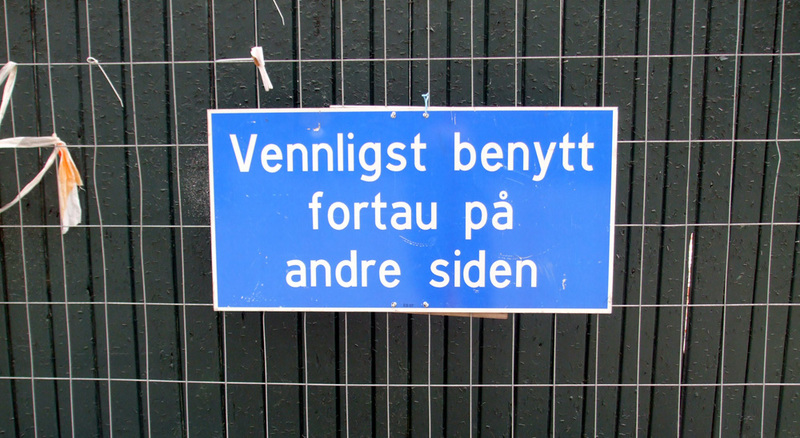 Take a language class before traveling, if possible. Classes are often offered at community colleges, or through adult educations. Public libraries often have language programs for check out, and Rosetta Stone programs are a good way to pick up the basics, although you have to pay for them. Invest in a pocket translator. These can be very helpful, and many are available in app form for your phone. You can also use Google Translate offline now. The time to ask for something in English is when you’re lost or need help, not when you’re ordering dinner. English is a world language, and in countries around the world English is a required course for many people. If you’re sincerely having a problem, someone will be willing to help. 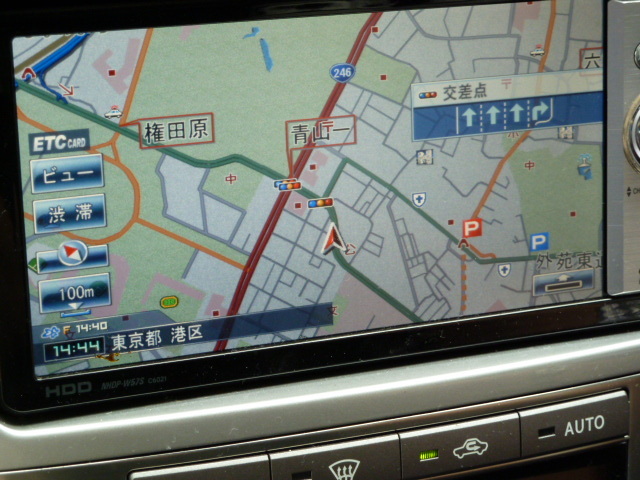 Hotel staff can write instructions for taxi drivers, etc., show where places are on a map and tell you how to get there. Focus on communicating versus perfection. Don’t be afraid to try to speak another language because you might make a mistake or lack fluency. Mistakes can and will happen and are unlikely to cause an international incident. Language is one of the primary carriers of culture for any place in the world. Learning a little of another country’s language whenever you go somewhere can not only open doors, but will also help you develop a better understanding of the place you’re visiting. 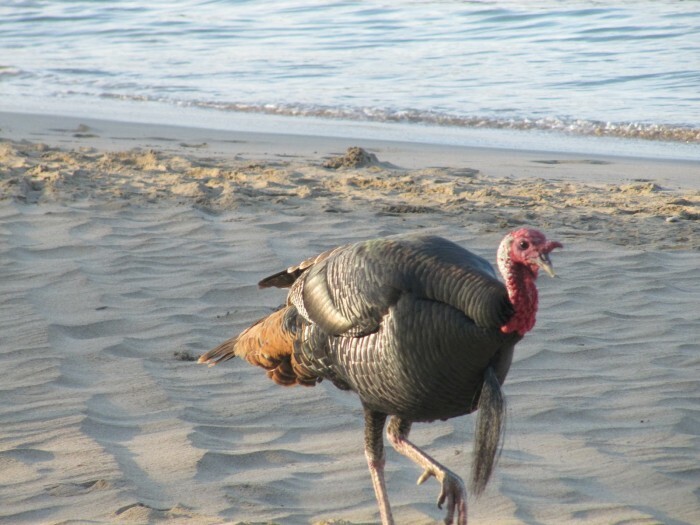 Not as strange as you might think – there are loads of wild turkeys on the Big Island! Brett and I have been on our own most of this weekend while YaYu has been at a Key Club retreat up in Koke’e State Park in Waimea Canyon – she’s due home in a little while. It rained all day yesterday over the whole island, so we’re wondering how her weekend went because the group had several outdoor activities planned, things like trail maintenance and such. Brett and I didn’t go anywhere or do anything more than food shopping, but it was still nice not having to work our whole schedule around YaYu’s. Her being away reminded us though of how soon she will be leaving the nest, so while we enjoyed not having to bend to her timing, it was also slightly tinged with bittersweet. It’s been nearly two weeks since I ordered my recumbent bicycle from Amazon, and it is FINALLY arriving tomorrow. While we always allow things to take a few extra days to get over here to the island, two weeks was a bit much, and when I checked the status of the order last Thursday it said the item hadn’t even been shipped! I called Amazon, explained the situation, and apparently something had accidentally stalled at the shipping step. The representative apologized, and immediately changed the shipment to express status for no additional charge. I’ve gotten confirmation that the bike is on its way, and tracking says it will arrive tomorrow. We’ve never had any problems before with Amazon shipping things over here, and I was impressed by how quickly they admitted an error and rectified the problem when one occurred. 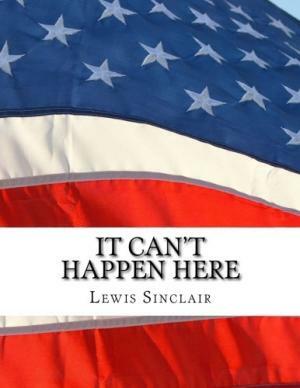 Reading: I’ve put down Truevine for a while and right now am reading It Can’t Happen Here, written in 1935 by Sinclair Lewis, about the arrival of fascism in America. Although the book is fiction, it’s chilling how it closely parallels in many ways what’s happening in our country now. Listening to: We’re enjoying another cool, quiet morning here. Once again there’s one rooster out there screaming his lungs out, but otherwise it’s very peaceful. The noise will pick up soon when YaYu arrives home and the laundry gets started. Watching: Brett and I watched the Netflix series The Crown last week and can’t recommend it enough. Wonderful acting, and it was interesting to watch how the male establishment reacted to serving a young female monarch, and how she found her voice. We’re watching The Americans now, about Russian communist spies living in the U.S. in the early 1980s. It’s frightening, and not in a good way. Cooking/baking: Brett made us french toast this morning for our breakfast to use up the last of a loaf of sourdough bread. A pork roast is cooking in the slow cooker for barbecue pulled pork sandwiches tonight (I’m having a vegan barbecued “pork” sandwich). I’m going to make a pan of brownies later this afternoon because YaYu has been wanting something chocolate. Happy I accomplished this past week: Once again it’s been another week of mostly resting my back. I did some of the cooking this past week, or at least helped out more, and was able to help out more with other chores. Sounds boring, but it means I really am getting better. Brett and I worked on our shopping list together and got most of that done Friday and yesterday. We’re making good progress on getting the freezer cleaned out. Looking forward to next week: Besides getting my new exercise bike, I’m also greatly looking forward to enjoying Thanksgiving with Brett and YaYu at the Hukilau, and our annual holiday viewing of The Decendants. And, my highschool friend and her companion arrive for their visit next Sunday. Thinking of good things that happened: Amazon’s quick response to fixing the shipping for the exercise bike offer was very impressive. The weather has been cooler this past week, wonderful for sleeping. Brett and I tried out a local supermarket that’s closer to our home and were impressed with both their selection and prices, so it looks like the Kapaa Big Save will be our new market from here on out. Costco finally got the Japanese cakes in – we bought three boxes of dorayaki, and two of the imagawayaki. Brett and I made and ate pancakes for our Friday dinner while YaYu was away. She doesn’t like them, so we haven’t fixed them for a long while (and they were delicious!). We had no food waste, and put $2.90 into the change/$1 bill jar. Grateful for: I am so thankful to be living in Hawai’i right now with its spirit of aloha. Diversity and acceptance is infused into every aspect of life here, and kindness rules the day. Bonus question: What’s your favorite part of Thanksgiving? Besides being together and sharing food with family and friends, the best part of Thanksgiving for me has always been the leftovers! While I love the holiday meal, I especially love the hot turkey sandwiches, turkey pot pie, turkey divan casserole, turkey soup and other dishes that we enjoy for several days afterwards. This year though I’ll be fixing our turkey dinner when the girls are home for Christmas, so the leftovers will have to wait until then. What’s your favorite part of Thanksgiving? What do you like to do with Thanksgiving leftovers? Do you have any good recipes you’d like to share? Hope all of you had a good, or at least better, week! This past weekend, Mrs. 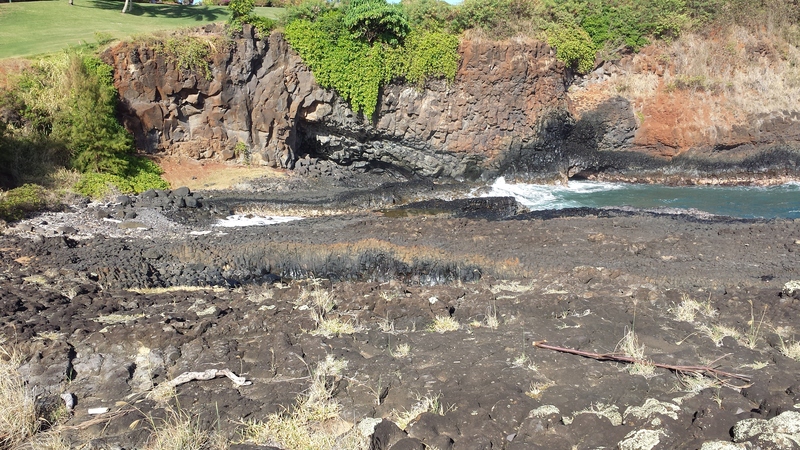 Occasional Nomad asked what I intended to do while YaYu was studying with her Mandarin tutor, and I told her I thought I might explore another little beach near Lihue. 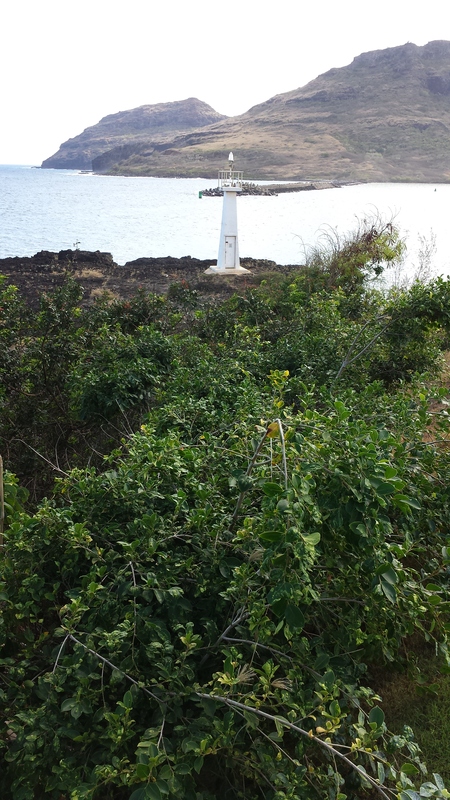 However, on my way to the Ninini beaches (there are two), I was distracted by the sight of a little lighthouse. 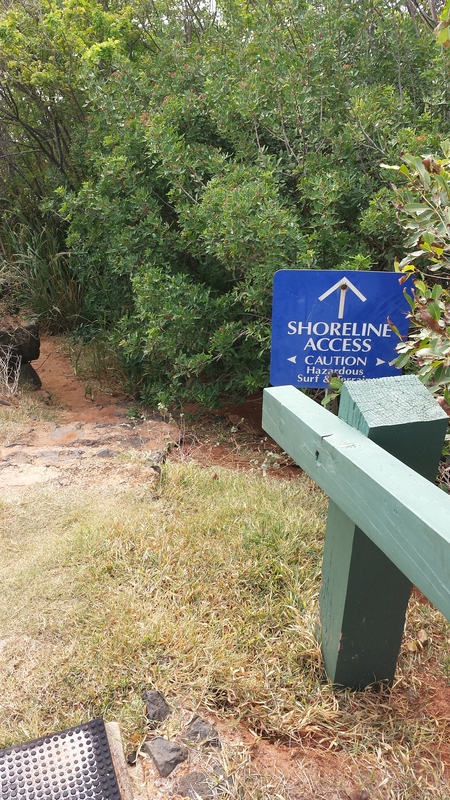 By following the “Shoreline Access” signs from the Kaua‘i Marriott Resort I arrived at Kukii Point, across from the breakwater at Nawiliwili Harbor. 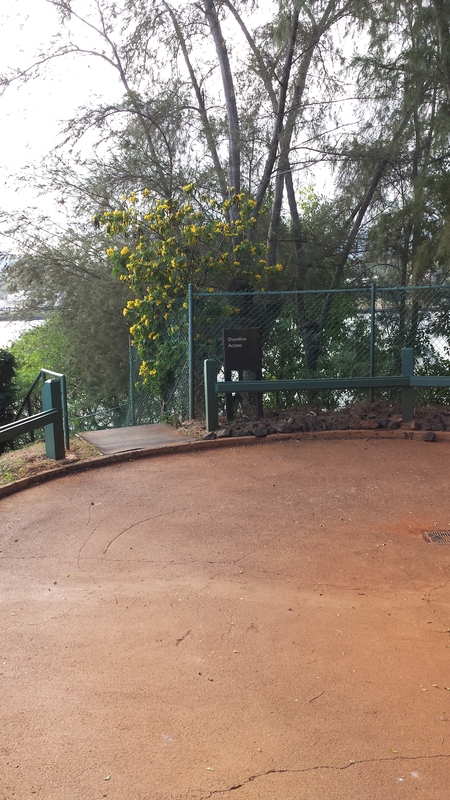 Parking was available at the end of Kalapaki (double-yoked egg) Circle, and I walked from there around the loop surrounding a huge ficus to get to the somewhat steep pathway and stairway down to the 16th hole of Kaua‘i Lagoon’s Kiele (Gardenia) Golf Course. At the turnaround for golf carts, there was a short rubber-clad stairway that ended only a little closer to the shoreline. 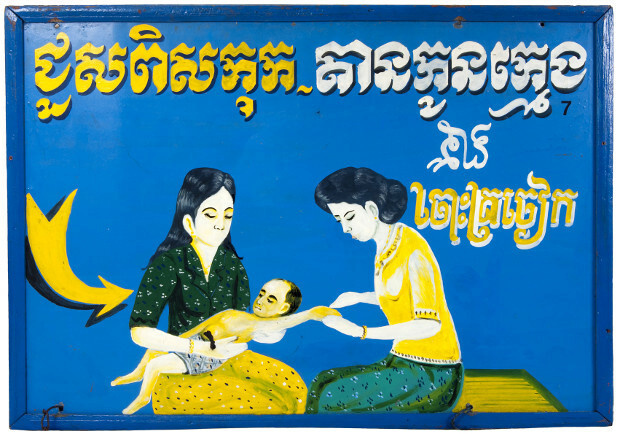 A blue warning sign was waiting at the bottom of the stairway, where the path simply disappeared into bushes and guinea grass (Megathyrsus maximus), also called buffalo grass or elephant grass. If, like I was, you’re wearing shorts, you won’t want to go this way because this tall grass bears fine, whisker-like stickers the first few feet above ground, and the upper blades are just that: blades. 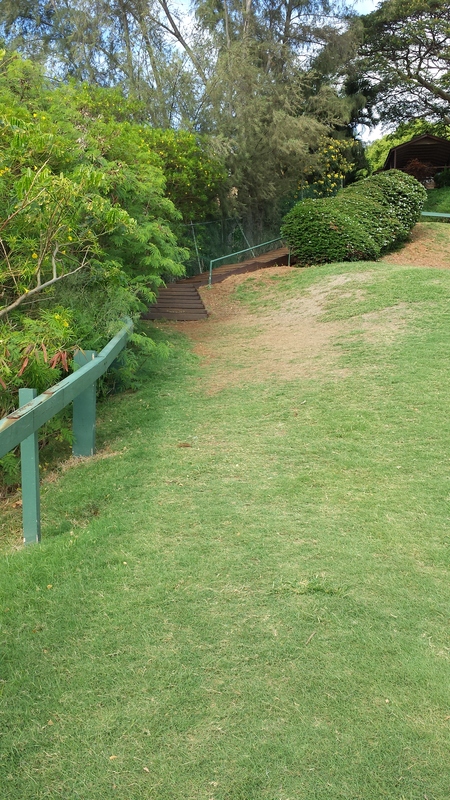 I walked around the berm between the bunker and green to my left and found a more inviting, though steep, descent. 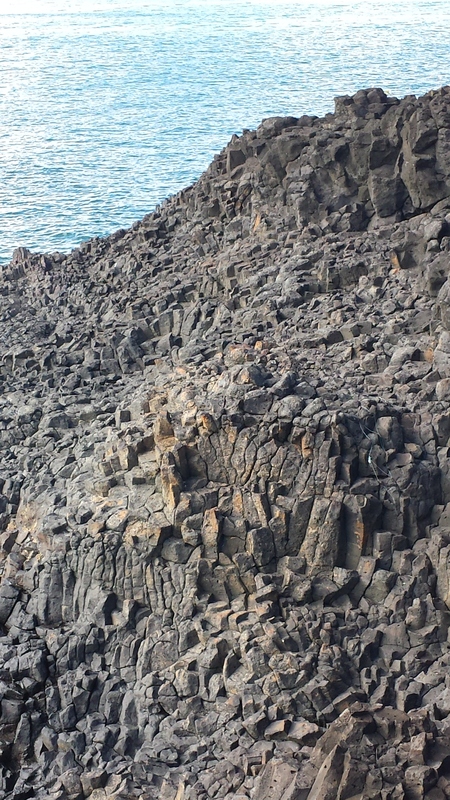 Once I was down to the harsh pumice field (where my hide would have remained in perpetuity if I fell—probably should have recommended running/hiking shoes earlier) I could see three channels scouring away the point to the left of the lighthouse. Both the two narrow channels and the broad channel up the middle of the pumice field afforded spectacular demonstrations of the hazardous surf at work here. Rip-rap dumped at the head of the broad channel created interesting random click-clack sounds like the colliding balls on a pool table at the break. Intense wave action on the other side of the point often makes for some decent surfing at Kalapaki Beach, but at the same time the surf rips into the jagged stone that supports the foundation for the lighthouse. I could spend hours—weeks, months, years perhaps—exploring and sharing photographs of these rocks, and the wave action, but know that may not delight everyone. 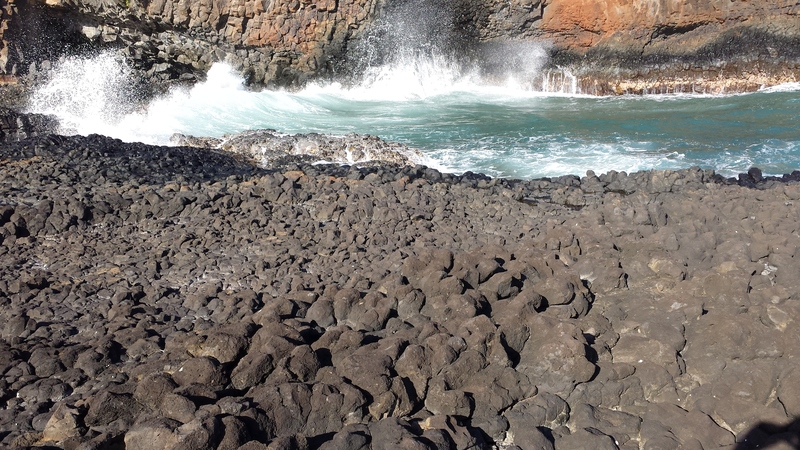 If you enjoy geomorphology as much as I do though, I invite you to come on over to my island sometime and watch the shoreline tumble into the Pacific. 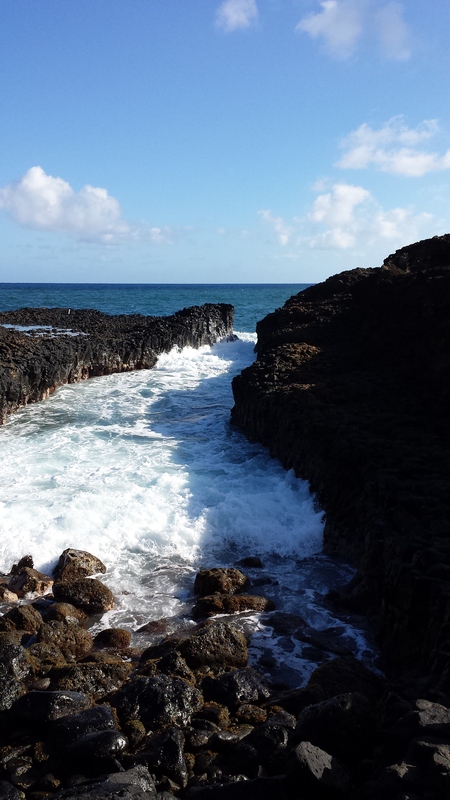 After watching rocks and surf for a while, it was time to proceed back up the stairway, pick up YaYu, and head for home. Getting better – at least we can easily see what we have now. The frost is getting worse though. We are starting to make a dent in our freezer stash, but we still have a ways to go. I organized everything (or at least tried to) in our garage freezer this past weekend so I have a better of idea what’s out there, and I think we’re looking at maybe another three weeks before it can be turned off for defrosting. One of YaYu’s classes this term is a culinary course. The class focuses on cooking, both preparation and technique, and students, working in teams, prepare a different dish each week. They are also tested along the way on their developing skills – YaYu has become quite proficient with a knife! I took home economics back in high school, but the course she’s taking goes much deeper than anything we ever did in the kitchen. Students who finish the entire culinary pathway leave school with the skills to work in a restaurant kitchen, or continue on to culinary school to develop their skills even further. We have been letting her do more in the kitchen here, and this week she’ll take over for a couple of the meals. We’ll need bananas, mung bean sprouts, cucumbers, bok choy, and zucchini from the farmers’ market this week. Otherwise, everything else is what’s on hand in the freezer, pantry and fridge. How much do you think it would cost a U.S. family of three to visit Japan for a week? $7500? $10,000? More? There is no doubt that Japan can be an expensive place to live and visit (although Tokyo is no longer ranked as one of the top ten most expensive cities on some lists). It’s also one of the most expensive destinations to reach from the U.S. But, there are ways to go and have a memorable visit for much, much less than you probably imagine. Brett, YaYu, and I will spend nine days in Japan next year for $5450, including airfare, an amount many might imagine it would cost for just one person to go. By the time we leave next spring, we’ll have been saving for this trip for nearly a year, and by taking advantage of some of our military benefits, and using our experience and other tips we’ve picked up along the way we’re going to have a great vacation at a very affordable price. We have family in Japan, but we won’t be staying with them – their condo is too small to add three adults, even for one night. Our son and daughter-in-law may take us out to eat while we’re there, and we’ll probably eat at their home once or twice, but we will reciprocate and take them out as well so our budget wasn’t based on any “family” savings. Transportation: Other than arriving by cruise ship, the only way to get to Japan is by air. 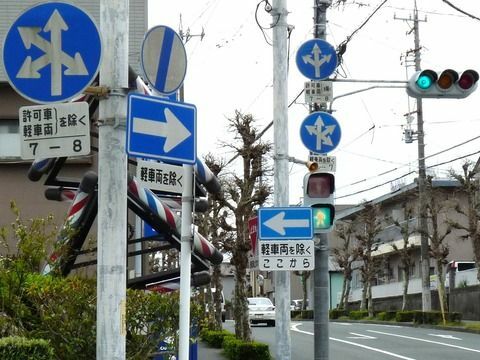 This is where research becomes vitally important because transportation to and from Japan can take the biggest bite out of your budget. To begin with, and in order to find the best deal on airfare, you have to know what typical round-trip fares are. From Honolulu, for example, nonstop economy fares to Tokyo typically run in the $900 – $1000 per person range, sometimes more (fares are generally a bit lower from the mainland). There are sometimes much lower fares available, but check carefully because often those ‘good deals’ involve long layovers somewhere and a long travel day either coming or going, something we try to avoid. For our trip next year, we set our upper limit for airfare at $900 per person ($2700 total), with upgrades, if any, included in that amount. A few weekends ago I found nonstop round-trip fares and a terrific flight schedule at $750 per person, and we snapped them up. Premium economy seats were $1060 per person at the time and over our maximum, but as I’ve written, I was able to upgrade via the airline’s website for just $158 per person, making the total cost for each ticket $908 per person, or $24 total over our budget, an amount we could live with, especially for upgraded seats. Patience (and a little bit of luck) is key for finding a good ticket price and schedule to Japan, and you have to be willing and ready to jump in and buy when you find a good price that works for you, and then live with your decision. Another consideration when purchasing tickets for Japan is whether to fly in and out of Narita or Haneda airports. Haneda airport is the most convenient for Tokyo, only around 40 minutes away, but flights in and out of there will almost always cost a few hundred dollars more than ones into Narita. Narita airport is unfortunately convenient to nothing other than the town of Narita, but a round-trip ticket on the NEX express train into Tokyo and back can be purchased by international visitors at the airport for a little less than $40 per person ($120 total for us). Lodging: On our upcoming trip we will be using one of Brett’s earned military benefits and staying at the New Sanno Hotel, run by the U.S. Navy for the exclusive use of military personnel. As retirees, we can stay there only if Brett is along; without him, I can use all the facilities and restaurants, but not stay overnight. Our room (queen bed plus single sofa bed) will cost us $67 per night, tax included, so our entire lodging expense for nine nights will be $603. The hotel is in a great location for us, just a 10-minute walk from our son’s condo. If you’re not eligible for someplace like the New Sanno, business or boutique hotels run around $115 to $125 per night. 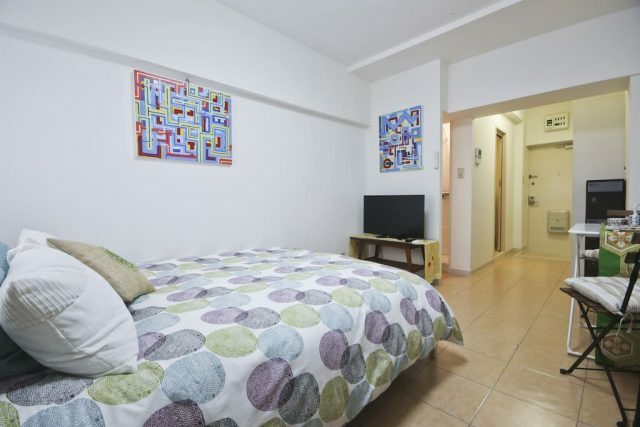 The rooms are smaller and not as luxurious as the major hotels (which can run $300 to $500 per night), but they’re clean, comfortable and sometimes very stylish. AirBNB in Japan is another affordable option, where you can find entire small apartments for less than $100 per night. The AirBNB rentals we used on our last trip exceeded all expectations for comfort and cleanliness, and our hosts were extremely helpful. Brett and I are planning to use AirBNB when we go to Japan for longer stays in the future, for the savings and the cultural experience. 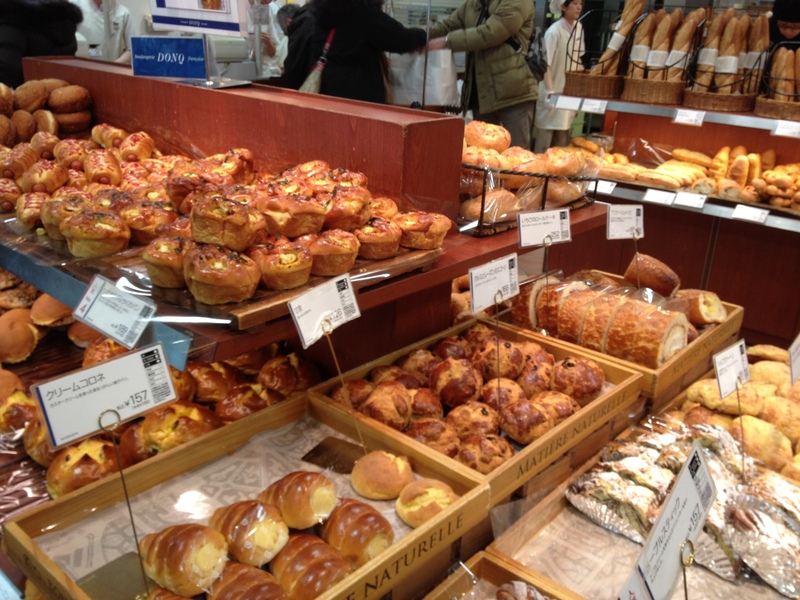 A typical Japanese bakery – those creme-filled coronets in the front left cost just $1.50 each. Some of the rolls above contain cheese and bacon or ham and are a little over $2.00 each. Dining/other expenses: We’ve budgeted $200 per day for the three of us for our meals, in-country travel, and other expenses, plus a couple of extra hundred dollars “just in case” ($2000 total). Our days will start with coffee and pastries – Japan has the most incredible bakeries, and a Paris-worthy pastry and coffee cost around $5 – $6 (less if we make coffee in our room). For lunch we often buy something ready-made from a convenience store or supermarket, for around $8 or less per person. Stores like 7-11 or Lawson carry all sorts of interesting bentos, but there are also noodles, fried chicken (yum! ), potato salad (yum! ), sandwiches, yakisoba, and several varieties of the girls’ favorite onigiri (rice balls). Another inexpensive lunch option is noodles, such as soba (buckwheat noodles), udon (wide wheat noodles), or ramen (Chinese-style noodles). A big, filling bowl of noodles can be found for around $10. Other inexpensive lunch options are kare-raisu (rice topped with curry) and gyoza (potstickers), and ‘set lunches’ can be found at many restaurants for an affordable price. There’s almost always a plastic model of these lunches out in front of a restaurant so you can see what’s available, and only have to point to it when you want to order. The evening meal is when we typically ‘splurge’ and allow ourselves to spend a little more, up to $18 or so, and the possibilities are endless. Besides Japanese foods, there are restaurants serving almost every type of foreign cuisine you can imagine. Meals in Japan come with water and tea, but you can usually order beer or soft drinks at most places, although they’re not all that inexpensive. Besides dining, in-country transportation is factored into our daily expenses as well, for train and taxi fares. A round-trip train trip within Tokyo can be up to $10 but is usually less, maybe $2 or $3 each way. The most expensive journey we’ll make on our trip next year will be to Kamakura at around $18 per person for a round trip ticket, but Kamakura is located over an hour and a half outside of Tokyo. If we were planning some longer day trips, traveling to another part of the country, or staying longer than two weeks we would most likely purchase a rail pass, which would save loads of money. These passes can only be purchased outside of Japan before arrival though – they’re not available once you’re in country. We don’t use taxis all that often, but they can be very convenient. Taxi fares in Tokyo currently start at 730¥ – around $7.00 – and to go around a mile will add another 580¥, a bit less than $6.00. Your fare will add up quickly though for longer rides, especially if you find yourself stuck in traffic. Other daily expenses can include entrance fees to museums or gardens (anywhere from $3 to $5 per person), but we spend most of our time walking around and visiting places that don’t cost anything, like temples or shrines or parks, and window shopping is also fun and doesn’t cost anything. There are free guided walking tours available in Tokyo (in English), and you can sign up for free, private full- or half-day guided tours with an English-speaking guide if you want to visit Kamakura, the only cost being lunch for your guide and possibly some entrance fees. Free guided tours are also available in Kyoto. We usually splurge for an afternoon treat of some kind when we’re out, like crepes in Harajuku, or some ice cream or another fabulous pastry. 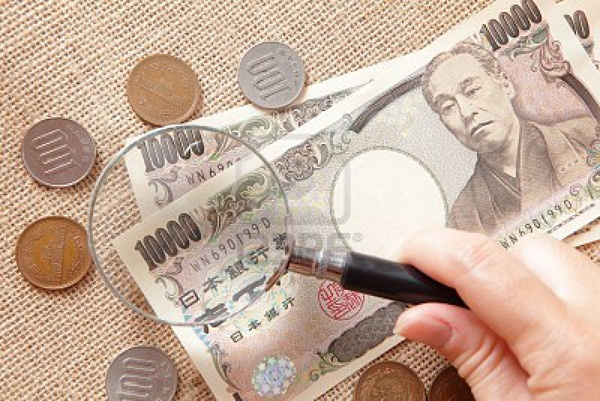 There is no tipping in Japan, either for food or transportation. Other than picking up interestingly-flavored KitKats and other foods we can’t find here, or a couple more tenugui for the kitchen, we don’t expect to buy much of anything. Pictures and memories are our favorite souvenirs to bring home. One new expense this trip will be a prepaid SIM card for our phones, around $33 for seven days. They weren’t available on our last trip (we rented a phone), but we want one this time so that we can contact our son or daughter-in-law if necessary. Many AirBNB rentals offer pocket WiFi that you can carry with you for free or a very small fee, and/or you can rent them from your hotel. 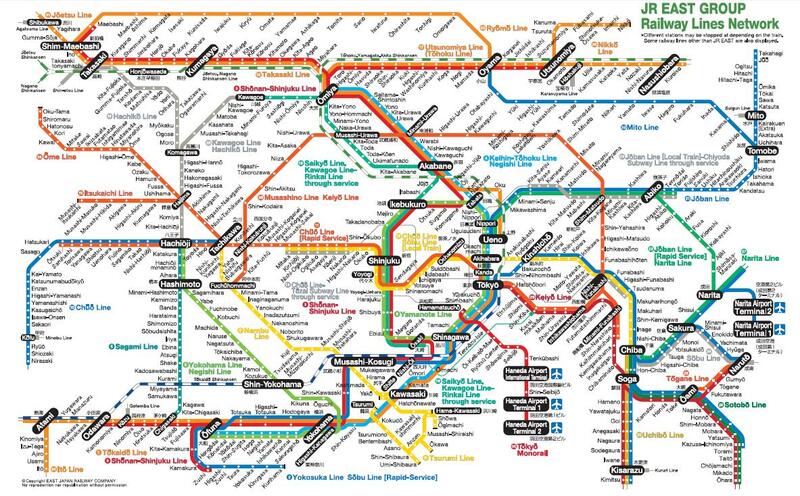 A Tokyo train & subway map may look complicated, but is actually quite easy to figure out and will help you get around the area cheaply and efficiently. I’ve always had someone offer to help if I seem confused about how to get somewhere. The absolute best way to save money and see Japan for less is to come with a sense of adventure. Japan is very different from the U.S., from the language to the food to the customs, and even if something looks familiar it will always have a unique Japanese twist to it. But, a visit to Japan is an experience like no other. 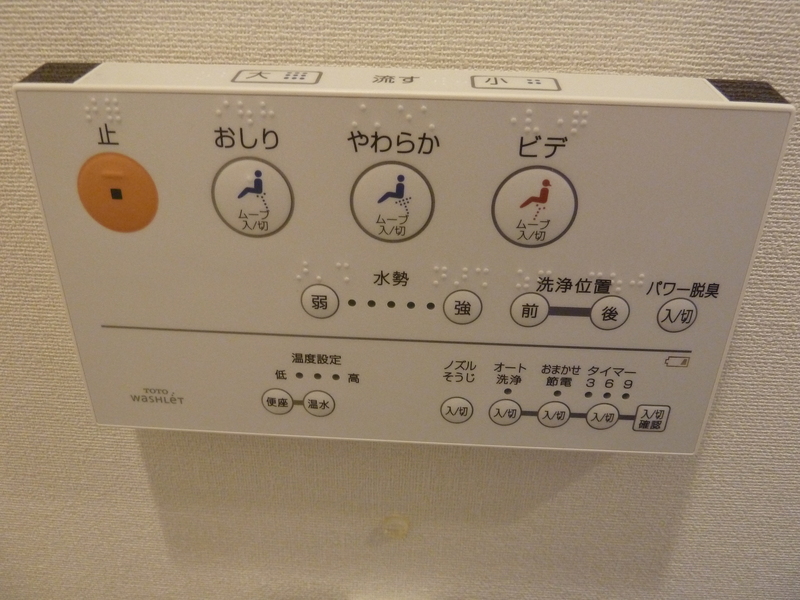 It’s clean, it’s safe, and the Japanese are courteous and helpful to a fault. If you speak a little Japanese, even a simple phrase, you will be praised to the skies. If you get lost someone will help you. I’ve had Japanese people get on a train with me to make sure I got to the right station, or walk with me somewhere to make sure I didn’t get lost. Trains, subways and sites around Tokyo have plenty of English signage these days, in preparation for the 2020 Olympics, making it much, much easier to get around than even just a couple of years ago. Seeing Japan on your own is only limiting or frightening if you let it be, but armed with a good guidebook and map, you can get around and have one of the most memorable times of your life for way less than you might imagine.